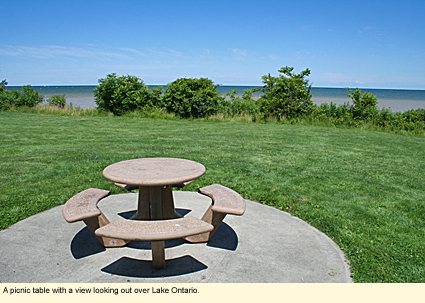 Located on the southern shore of Lake Ontario in the Wayne County town of Huron, this waterfront park is best known for its towering, sandy cliffs, dramatically sculpted by wind and water. The park's main entrance is on Garner Road with a smaller parking area at the northern end of East Bay Road. Lake Ontario was, at one time, a much larger lake, stretching, in Wayne County, to Lake Road and, in some cases, to Ridge Road. As the glaciers receeded about 12,000 years ago, they left behind huge piles of glacial till (a mixture of sand, clay, and stones of various sizes) called drumlins. Some of these drumlins rise more than 150 ft./45.7 m. above sea level along parts of the southern shore of Lake Ontario. Vegetation grew on top of the drumlins and, in some cases, farmers in the region have planted their orchards and vineyards in this till. 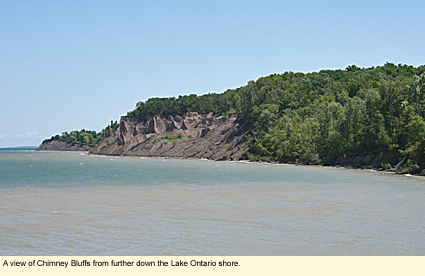 But the waters from Lake Ontario have pounded away at the northern face of these drumlins, causing them to erode. 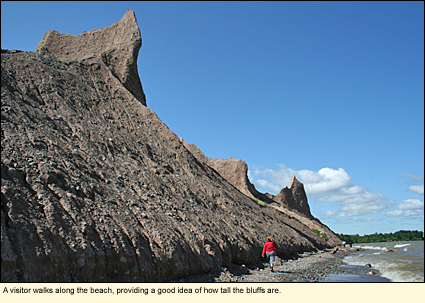 Chimney Bluffs is the most spectacular example of this erosion. From a human perspective, it seems as if these bluffs are eroding away faster than ever, as the lake tries to reclaim the land it once owned. 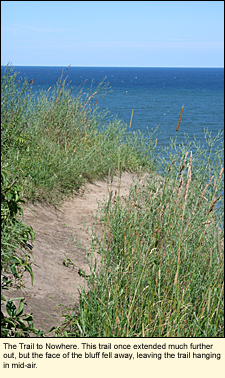 Chimney Bluffs State Park is a day-use park centered around the exploration of and the appreciation for the bluffs. Bathroom facilities are available as are picnic tables, but there is no pavilion for large groups, and there is no camping permitted in the park. There are four trails that zigzag through the park. Sandals and dress shoes are not appropriate for any of these trails. 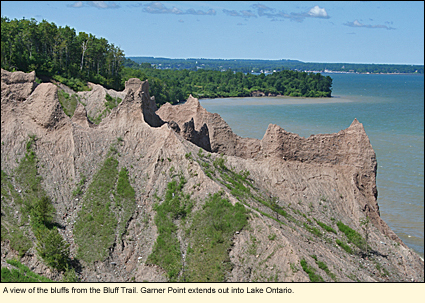 Please note: Due to severe erosion, Bluff Tail no longer exists, having fallen into Lake Ontario during late winter 2018. Every effort is being made to create a replacement trail. Further details to follow. ♥ Garner Point Trail runs through a woods out to a point in the lake. From the point, you will have a fine view of the lake and Sodus Bay. ♥ East-West Trail runs through several habitats. Part of it is a mowed-grass trail that runs through open field or shrubby woods. The rest is a dirt trail through deep woods. ♥ Drumlin Trail is a short, dirt trail that runs through deep woods. Birding, especially during migration, can be very good at Chimney Bluffs State Park and all along the shore of the lake. The park has about three-quarters of a mile (nearly a kilometer) of beach, however, about one-third of that is under water. The rest of the beach is narrow and covered with cobblestones (oval, fist-sized stones that have been worn smooth by the water) and other beach debris. The area is ideal for exploration, photography, and getting a proper sense of the enormity of the bluffs. Non-motorized boats may be launched from the beach at the end of East Bay Road. Biking may be done on any of the roads in the area. The land here is flat to gently rolling, providing easy biking, however, most of the town road don't have paved shoulders. Helmets should be worn. Open year round from dawn to dusk. However, the trails may close at any time due to bad conditions and are usually closed in the winter. Snowshoeing and cross-country skiing when snow cover permits. Pets must be leashed.